Just like a cocktail mixologist creating a signature drink with an interesting twist or garnish, the mixology of design is in combining different styles of interiors and architecture. Modern furnishings and art blended with architectural details and antiques is one of my favorite combinations. Oftentimes finding that unexpected piece can be the perfect ingredient for some of the best design elements in your home. Every fall and spring, visitors eagerly await the opening of the highly anticipated Round Top Antiques Fair to search for unusual finds and new trends in design. One of the crown jewels of the festival sits at Market Hill. This venue, created by Paul Michael, hosts dealers who bring in everything from European lighting, architectural antiques, modern furniture and accessories. It is here where you might find the perfect design trifecta by uncovering an Italian Murano glass hanging fixture from the 1970s and a modern glass coffee table that can add the perfect touch to a home hosting an 18th century European fire surround. Paul and his carefully curated collection of dealers will welcome you into their booths. I encounter clients and friends who like many different styles of architecture and interiors. Blending those can be a challenge. Throughout my 20 years of architectural consulting and interiors, I have watched these ever-changing design trends take a front seat in our world. I encourage you to let your mind wander as you meet the dealers in Round Top, and hear the stories behind their travels that bring both timeless and trendy treasures from every corner of the world. My philosophy at Sarah West & Associates is based on the blending of historical and modernist details which creates a perfect springboard for creativity where rules of the past don’t always apply. 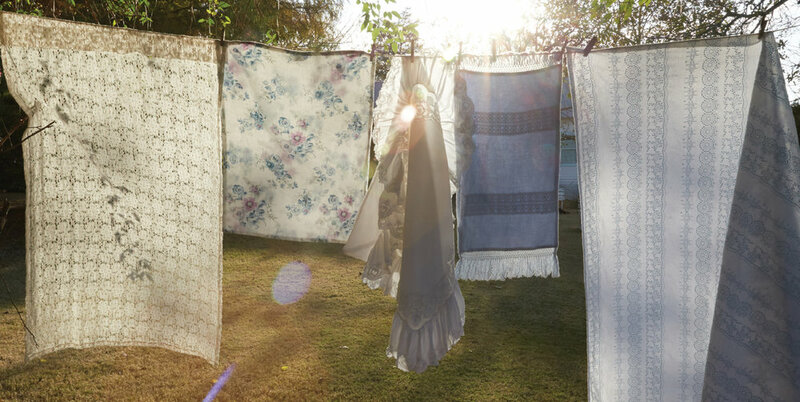 Uncovering special pieces at Round Top can be the common thread that runs through the fabric of my design plan. Embracing the challenge of making each project different, whether it is a blend of contemporary, English, Spanish or Country French, can always be enhanced with special finds from these bluebonnet-blanketed fields of Round Top. Whether you are a professional or simply a novice mixologist, I invite you to be daring, take chances, mix it up and enjoy the view. Photo by Ben Fitchett of the Midnight Rider Suit at Urban Cowboy in Nashville, TN. A big red truck pulls into the gravel parking lot. Through a cloud of dust, three doors spring open and out pop three beautiful women in cowboy boots. There is purpose in each step; these girls are on a mission. With them is a man – young, tall, handsome. He points to this chair, that table, those sofas, and the women pick up each item, carry them out and throw it in the back of the truck. When the truck bed is full, they pile in and peel out, leaving just as quickly and deliberately as they had arrived. These people know what they are doing. These people get things done. Come to find out, these people are Lyon Porter, Jersey Banks, Shawna Watterson, and Bobbi Rich a.k.a. Mama Hot Dog. This clearly isn’t their first rodeo, but it was their first trip to Round Top. Lyon Porter is a designer, real estate broker and hotelier best known for Urban Cowboy in Brooklyn and Nashville. Urban Cowboy is more than a place to hang your hat. It’s a home-away-from-home for nomadic creatives, an intimate bungalow where artists, thinkers, dreamers and doers arrive with curiosity and leave with inspiration – and new friends. The Brooklyn concept came first in 2014; then followed, in 2016, the eight-room Victorian mansion-turned-B&B in Nashville with a come-as-you-are bar and restaurant called Public House. Entirely self-designed by Lyon, these spaces are thoughtful, intentional and incredibly beautiful. The guest rooms feature intricate woodwork and tilework, rich textiles and striking accents such as clawfoot tubs. There’s a sense of whimsy and play, like the swing on the tree outside of the Victorian mansion. Starting at $350/night, you stay here for the experience – for its magic, in hope a tiny bit rubs off on you. What’s next for Lyon is his biggest project to date: a 23-room motel in East Nashville, formerly the 1956 Key Motel. This is what brought him (and his lady gang/design team) to Round Top: a buying trip for the motel. 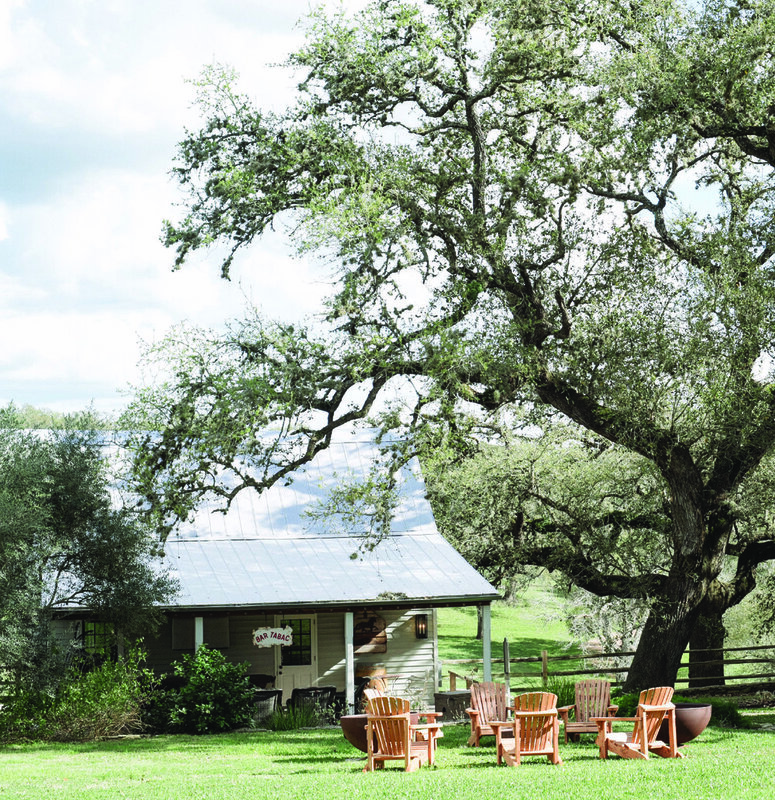 He also had an invitation from his friend Sheila Youngblood to stay at her place, Rancho Pillow, a 20-acre compound with a barn and teepee that’s more fantasy land than boutique hotel. Much like Lyon’s Cowboys, Sheila’s Rancho captures your imagination; it’s a cosmic community where you feel right at home. Arriving in Round Top, Lyon describes it as having: “No direction. We were just walking the fields.” Until they found Market Hill. Jersey Banks, Lyon Porter, Shawna Watterson, and Bobbi Rich on the porch at the Rancho Pillow in Round Top, Tx. 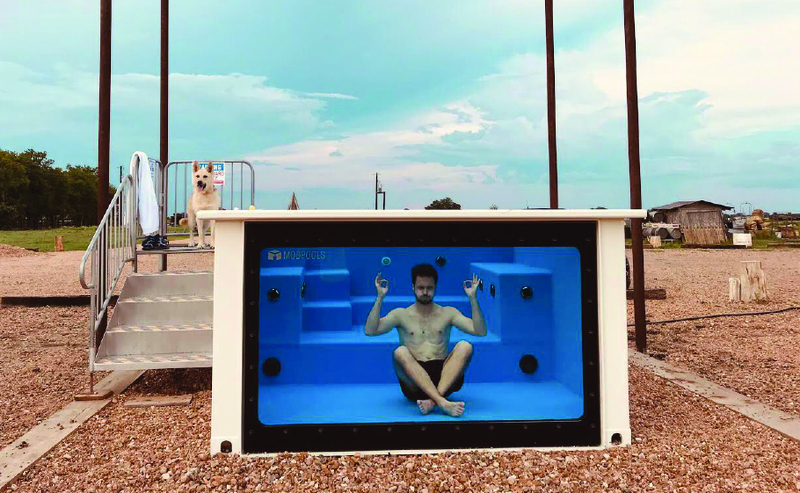 Instead of recalling the 50s-style of the original motel, Lyon is going for a funky, down-and-dirty, 70s vibe complete with a dive bar and a 60-foot swimming pool. Each room will have something he calls a “party on a switch” with music, a disco ball and lava wall. Among the many gems: an amazing group of couches and a piece of wood art in the likeness of Elvis Presley. In the meantime, check out Lyon Porter’s work at lyonporter.com, and the door’s always open at urbancowboy.com. Take a peek inside @urbancowboybnb on Instagram, and Lyon shares personal projects and motel updates in his stories @lyonporter. Hopefully, he'll let us know when the pool is open. Driving down from Little Rock to Lake Village, the sky is gray. Clouds droop heavily over the fields like water balloons about to burst. Rain is a welcomed occurrence in late summer in south Arkansas, and the crops all look like they could use it. But we can’t be delayed by this pop-up shower. We are determined to get to our destination: Paul Michael has something to show us: he has started painting. We arrive at his office on Main Street a little late, but it doesn’t faze him. He is happy to see us and ready to show us what he’s been up to. As you might expect, his office is unconventional. Vintage circus posters, petrol signs and a collection of antlers hang on the walls. There’s a fireplace and a brick oven, designed by Paul himself, for another one of his passions: baking bread, which is quite the process: The night before, Paul prepares a half-dozen starters. He wakes up at dawn to begin baking. By 2 p.m., there are 140 loaves, still warm from the oven, for the biggest charcuterie board you’ve ever seen with lots of butter, olive oil, meats, cheeses, fruit and wine, to be shared with 30 of his closest friends and family. To be around this table, breaking bread, is one of the more special experiences to be had (and one worth mentioning here), because the man builds, bakes and now he paints. Paul leads us through his office and into an adjacent warehouse space. Previously designated for online order fulfillment, it is apparent that art has taken over. Drop-cloths line the floor. Canvases in various sizes and stages of completion lean against every table. Picasso famously said, “Inspiration exists, but it has to find you working.” How inspiration found Paul: he and his wife Debbie (and partner in the Paul Michael Company), were on a work trip in New York in April. They went to all the major art museums and galleries and bought a few paintings. Gaining influence from this trip, Paul says he began thinking of art in his subconscious – something he’d never thought of or dabbled in before. 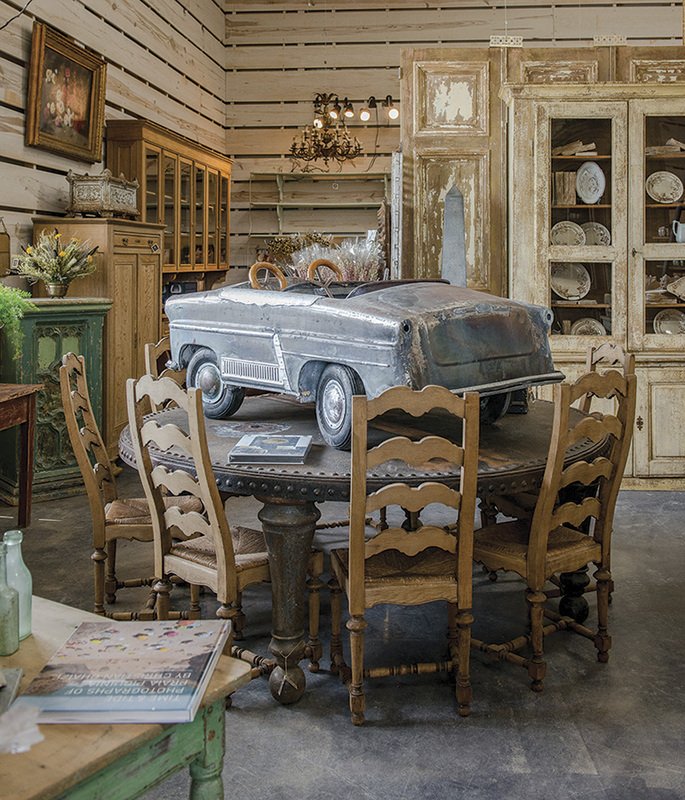 Celebrating 25 years of business, Paul, Debbie and their staff have continued to do things that separate the Paul Michael Company from others in the industry, including their line of Paul Michael Exclusives, 100% American-made pieces constructed from architectural salvage and reclaimed wood. Works of art in their own ways, these pieces are made by a team of designers and craftsmen at a woodshop in Dermott, Arkansas, open six days a week for designing, developing and manufacturing these original pieces of furniture. “Being surrounded by all sorts of art has a profound influence on everyone in the shop,” Paul says. An example of this is a console piece standing against the back wall of his office. Its doors have been replaced with canvases painted by artist Kellee Mayfield. “There is no limit to creativity. Sometimes you mess up, but you can’t be afraid of it,” Paul says. “In this day and time, art is the source of original creativity. There’s so much knowledge available about the products we sell. It’s difficult to define original art. You can’t Google art. You can Google an artist, but you can’t Google what he’s going to do next,” he says. Among Paul’s original pieces is an abstract piece in a tweed style pattern. On the canvas are pins strung with twine (“to keep my lines straight”). The lines overlap one another, creating a woven effect. When Paul’s attention turns back to furniture making, he mentions a few new pieces he’d like to show us. Soon, we are on our way to the woodshop in Dermott, about 20 miles away. We make one stop to eat lunch at Paul’s favorite sandwich stand, an Amish store stocked with jams and jellies, fresh baked bread, Georgia peaches and Arkansas tomatoes. After a quick bite, we’re back on the road to Dermott. The clouds have lifted; the sun has come out. Pulling up to the shop, it’s a very large, impressive operation. There are stacks and stacks of lumber piled high, an entire wall of nails and screws, various tables, chairs, cabinets, lighting fixtures and collections of found objects. Among these items are several never-before-seen Paul Michael Exclusives coming to Market Hill. These pieces are also works of art. The way he and his team incorporate natural elements into furniture design is part of the creative process. Paul leads us over to a long, low-slung object with a white drop-cloth over it. He lifts the cloth to reveal a beautiful table made from a slab of centuries-old cypress recovered from the bottom of Bayou Bartholomew in south Arkansas that now sits atop two pieces of Lucite. Paul describes the technology required in order to make such precise and technical cuts in the wood. It’s all part of the art of the Paul Michael Company, seeing potential that others cannot and crafting it into a unique vision. Another example of this is a 19th-century floor-length window cornice from France that has been turned into a bookcase, maintaining its original features and flourishes. These are just a few of the many new designs at the shop being prepared to be shipped to Market Hill. In addition to the new products arriving this fall, Paul says he’s most excited about what the vendors are bringing. 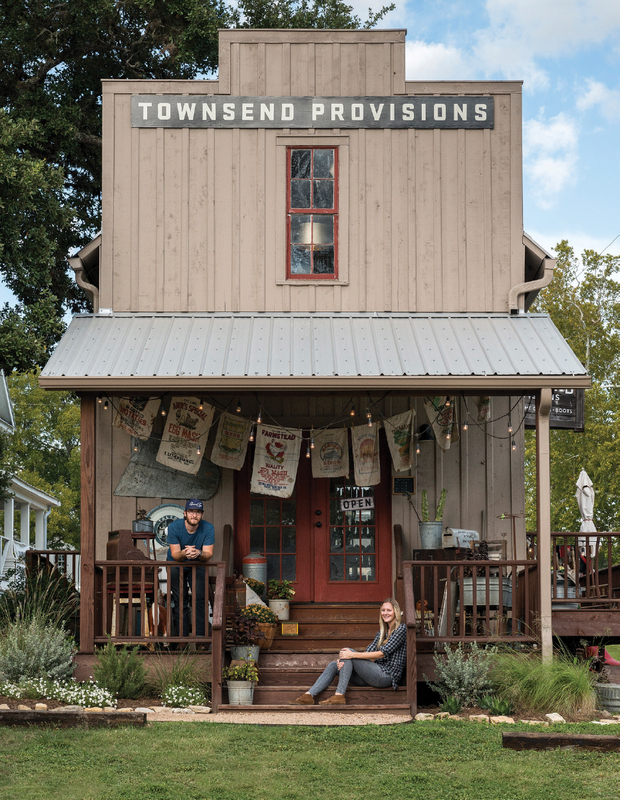 Even the most casual shopper will work up an appetite in Round Top. The Restaurant at Market Hill is open daily for lunch and dinner service, and provides an atmosphere of comfortable dining where you’ll want to sit around the table, share stories from the day, and make new friends. When you get to know Paul Michael, you will learn he has a passion for bringing people together. He has a brick oven that he built himself in his office in Lake Village, Arkansas, for baking and breaking bread with family and friends. It’s in this spirit that he wants to host annual pig roasts at Market Hill. Hearing him talk about it, he enjoys the seven-to-eight-hour process and the way people gather around to watch. There’s real curiosity, camaraderie and community around the fire pit. This fall, the restaurant will add a state-of-the-art, stainless steel rotisserie hog roaster. What you can expect each day at the Restaurant is a similar passion for people and for food. Preston Higgins, chef and owner of Baxter Catering Company in Bastrop, Texas, has 20 years of experience in the industry and takes great pride in his work. Everything prepared in his kitchen at Market Hill is grilled, roasted or smoked (there is no fryer) with the intention of preparing fresh, healthy, delicious meals for Market Hill customers and vendors. Daily lunch specials and dinner offerings include lamb, beef, chicken, fish and vegetables like Brussels sprouts, spinach, broccoli, asparagus and potatoes. When you walk up to the counter, go down the line and pick out which items you’d like, you’ll see Chef in the kitchen, working hard with a smile on his face. 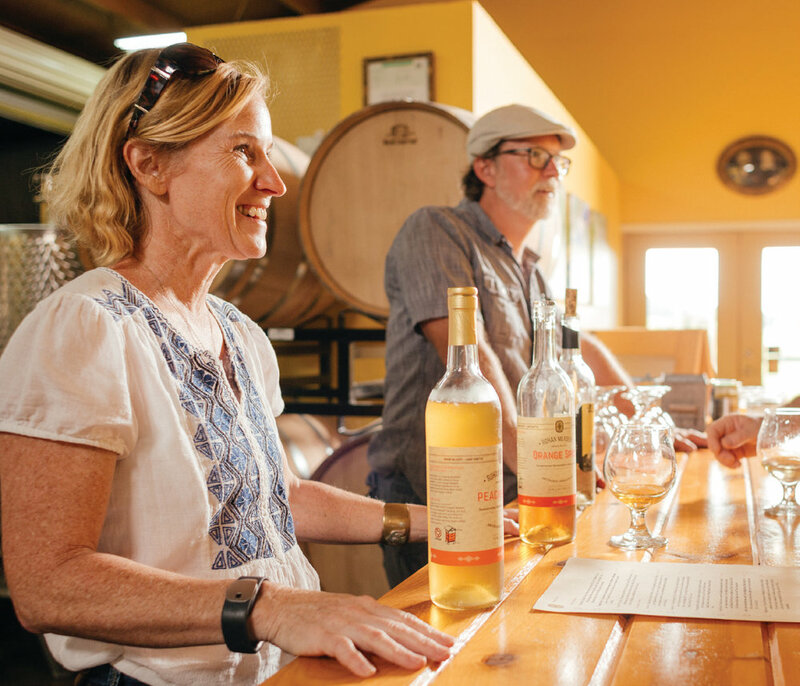 After your plate is made, you move down to the cashier where you can choose from a large selection of beer and wine or sparkling water and other beverages – anything cold sounds good after a day in Round Top – and homemade desserts. Then you find a table – the long tables in the restaurant are set up to be experienced family-style – and enjoy good food and conversation. Meet again at dinner. There’s also live music most nights during the show. Market Hill is more than a shopping destination; it’s a gathering place. Driving in from Austin and entering Round Top (population: 90) for the first time, the view from the car window gives you a good idea of the traditional experience that is the Antiques Fair. For 30 miles along Highway 237, the landscape is dotted with Texas bluebonnets, Indian paintbrush, and rows upon rows of big white tents with all kinds of antiques, accents and accessories inside. There’s not a cloud in the sky, as we watch people traipsing through the fields up and down each row while we drive through town making our way to Market Hill. Upon arriving, the parking lot is packed with cars coming in and out, but there are still spaces available, which shows us just how big and accommodating Market Hill is. Free parking (and plenty of it) is one of many amenities available to shoppers. Walking from the car, stepping out of the hot sun and into the air-conditioned space feels like the ultimate luxury, and that’s just the beginning. It’s beautiful inside. Entering through the Paul Michael Company, which takes up 11,000-SF of the space, it makes a wonderful first impression with original art on the walls, agate-topped tables, large cow hides, brightly colored sofas and plush pillows. The remainder of the 130,000-SF is mostly dedicated to the 18 vendors inside. Each room is well appointed and staged with the best lighting, antiques, accessories, rugs and art we’ve ever seen in one place. Each vendor is present and patient, eager to talk to you about any of their pieces and answer any questions you may have. Walking through the main breezeway, there is a sitting area with red velvet sofas called Pinky’s Bubble Lounge where you can sit and sip Champagne, which, of course, we did. The Restaurant at Market Hill is serving a variety of lunch options and a large selection of beer and wine. Chef Preston is in the kitchen, pulling a tray of potatoes from the oven. People are sitting around long tables, sharing stories, enjoying their meal and the comforts of this place. We grab a plate lunch, a couple of glasses of rosé and join them. The word that comes up most often when vendors describe Market Hill is the experience. “I believed in Paul’s concept of bringing comfort to the Round Top experience,” Ender Tasci of The Elephant Walk says of his friend Paul Michael. “Our venue provides an incredible amount of the most reputable dealers with their exceptional selection of merchandise. Our climate-controlled showrooms, food and all the other amenities make it a refuge for so many people visiting Round Top,” he says. Market Hill is open daily and offers lunch and dinner service at the restaurant. There is live music nightly. Paul is also doing a pig roast during the show; he is even building his own equipment for it. For Paul, it’s about bringing people together, feeding them, entertaining them and showing them genuine hospitality. This is the Market Hill experience. My life has been somewhat of a treasure hunt. At a young age, I took off to design school in New York. I would frequent the Upper East Side and West Side consignment shops during the week and comb the 26th Street Flea Market on Saturday mornings. After acquiring a proper education and amassing quite the collection, I moved back down South to open my shop and interior design business, Shabby Slips. Whether it be in New York, Paris, Atlanta or Round Top, my favorite place to be is a flea market. Here in Round Top, folks have organized one of the best places in the world to go on that elusive treasure hunt. The Round Top Antique Show started 50 years ago in The Big Red Barn, and the show is still alive and thriving today – and what an antique metropolis this tiny Texas town has become! It brings in people from all over this country and as far as Europe. Since the beginning, many shows have been added to the lineup, The Marburger Farm Show, the Arbor Show and Warrenton to name a few, with the newest being the Market Hill Show. 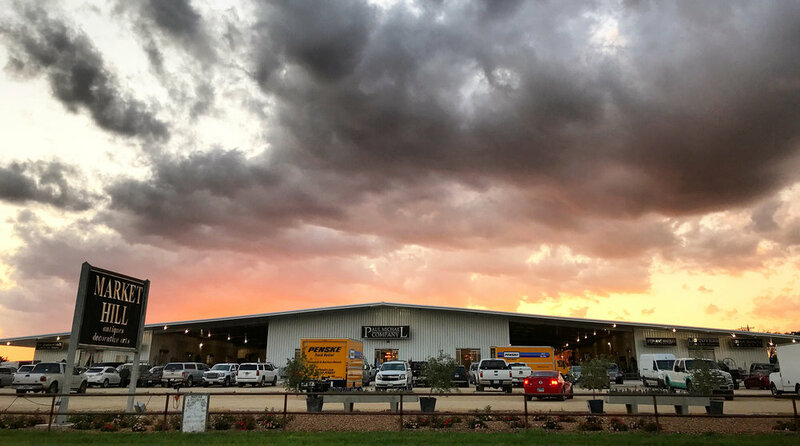 Market Hill brought a more permanent presence to Round Top making it easier for dealers and buyers to shop in good lighting, climate-controlled environment (air-conditioning is much needed!) and a great restaurant to meet a friend for a glass of wine after the shows. At Market Hill, dealers have a home, for years to come, making it an annual go-to event in the spring and fall for me. I arrive early and stay late. There is a huge variety of things to buy. I shop for design projects I am currently working on, or pick up store fillers. You name it; it's there. It doesn’t matter if you’re a professional like me, or just looking for that one small treasure, you are bound to find it and more. I hope this year will be another stellar one, after all, Paris is a much longer trip. See you in the fields! Marburger Farms – the best two Tuesdays of the year! Paul Michael of Market Hill, the Neiman Marcus of Round Top! Renea Abbott and her mom, Barbara Carlton, started Shabby Slips in 1991 as a custom slipcover shop. Over the years, they have grown their Houston-based interior design business and have continued to travel, collect, purchase and import high-quality antiques and products from all over the world. Learn more at myshabbyslips.com. Jewelry designer and maker, Vincent Peach comes from a long line of “pearl” men. His upbringing may have set him on this path, but his creativity took him in a direction all his own. What makes his signature pieces so intriguing is the use of radiant rare pearls, brilliant diamonds, precious metals and exotic leathers expertly put together in a wearable way. The interplay of old and new, masculine and feminine, dazzling diamonds and durable leather, it all works beautifully. One of Vincent’s personal favorites (or “top picks”) is the Montana Double Wrap in 14 karat gold with Tahitian pearl and premium quality bovine leather. His designs have been seen on celebrity clients from Miranda Lambert to Alice Cooper to Oprah Winfrey, which speaks to the range of styles he produces, but he wants everybody who wears his pieces to feel amazing, no matter who they are. Round Top presents a rare chance to meet the designer himself. Vincent always brings new pieces to the show. He says Round Top holds a special place in his heart, and that he considers it his happy place. Stacy Graubart says she first learned about a good design before she even learned to walk. “My mother would drag me to every antiques store, auction house and design store – even before I was out of diapers. We spent our weekends driving down winding lanes looking for architecturally interesting houses. My mother had extraordinary taste. The finest I have ever known,” she says. Stacy grew up in Houston, Texas, graduated from Vanderbilt University in Nashville, Tennessee, then moved to Paris, France, where she studied design. She later studied furniture and antiquities at Sotheby’s London. She began her design career working in the costume design industry for film and television, which culminated with an Emmy Award nomination. Midway through her design career, Stacy turned to her real love of interior design. After working for Arlene Semel & Associates, a Chicago-based interior design firm, she formed SG Designs. For 15 years, Stacy has concentrated on high-end residential design and renovation. SG Designs specializes in designing livable homes, not masterpieces. Stacy loves the process of getting to know her clients, creating and catering to their specific needs. The Select Pick is a new vendor to Market Hill, but Stacy has enjoyed shopping at Market Hill since it opened. Two Round Top properties designed by SG Designs will soon appear in Country Living and Modern Farmhouse magazines. To see more, visit sgdesignshouston.com. For Susan Horne, it all began at Round Top. “I have been showing in Round Top since 2013 but have been shopping the fields for the last 20 years,” she says. Raised in southern Georgia, Susan moved to Dallas then Houston where she met her husband, Houston-native Chip Horne, 25 years ago. A newlywed, she and her girlfriends, all recently married as well, would make the trip to Round Top to shop and to help each other decorate their new homes. It was out in the fields that Susan said that she would have a store out here one day, a booth in Round Top. It’s something her friends remind her of to this day. She is now a vendor at Market Hill. “The experience Paul Michael has created for us is amazing in so many ways,” Susan says. In the past, Susan says she would only be able to take some of the pieces from her collection to Round Top because of being outside, being in a tent and being exposed to the elements in the heat, wind or rain. Now, all of it comes to Market Hill. “Our containers arrive right to our space, and Market Hill provides help with the unloading, the installation of lighting and the placement of heavy items,” she says. More than the amenities, she talks about the people. It’s also a part of her creative process. “Our creative process starts the minute we finish each show. We take into account what our clients have expressed, the pieces they are looking for and the feedback we get. We make lots of written notes, and we keep all these ideas in mind as we start our buying trips,” Susan says. Other inspiration comes from her daughter Meghan as they work and travel together. “She has really helped me expand my taste into more pop culture and mixing antique pieces with modern and new pieces from market. It is very exciting to see what the young people like buying,” Susan says. On their buying trips, the beauty and history of Europe also inspire Susan and adds to that creative process as well. Among the pieces they have curated for the spring show include an 18th century Italian mirror with a beautiful crest and crown on top. For more information, visit susanhorneantiques.com where you can very soon shop online for antiques and a special line of candles sourced from the U.K.
Somewhere between impressionism and abstraction, Stephanie Wheeler’s paintings shine through to reflect the masters who came before her (Manet, Degas and Bonnard) and emanate a style that’s uniquely her own. “Painting is such a pure form of creativity… and to work with color is what I really love doing. My work has become more abstract, more about manipulating the paint and surface, but it’s always about the color… I can push color, but it’s not jarring to the eye. There’s a softness to it,” she says. Preparing for her 11th year at Round Top, Stephanie was the first visual artist to appear at the Antiques Fair, attending a decade ago on the insistence of a friend. Stephanie says it was “unconventional” back then for a painter to show artwork at an antiques show. Now her works are available exclusively at Market Hill. A professional painter since 2002, Stephanie never imagined a full-time career in it. She studied art in college, but it wasn’t her major. Her father, also a talented painter, discouraged her from earning an art degree but did encourage her to study with greats. She immersed herself in the teachings of Russian figure painter, Marc Chatov. Much of her work today has been influenced by Chatov. She has also studied with some of the best contemporary artists in the country: Andy Braitman, Linda Christensen, Ted Goerschner, Jenny Nelson, all of whom, she says, have played key roles in her exploration of the landscape, figure and abstract space. Stephanie’s work has been displayed throughout the U.S., Canada, British Virgin Islands and Europe, but she still finds something special about Round Top. For the upcoming show, she shares her inspiration for several new pieces. “I had the opportunity to travel to South Africa this past fall. During the three-week trip, I traveled all around this beautiful country from Cape Town to Blyde River Canyon and then several days on safari in Krueger National Park – a complete bucket list experience! The awe-inspiring landscape, natural beauty and wildlife made a definite impact on my creative mind,” she says. For customers looking for her more recognizable pieces, she is bringing her Colorado Aspens. To view more of Stephanie’s work, visit Stephaniewheelergallery.com. From the 1800s until the 1940s, the Scoville Brown Warehouse in Wellsville, New York, hummed with the sounds of a bustling grocery wholesaler. Though the wares have changed, the sounds of a busy building remain. Also evident is the “Hearts Delight” slogan, still visible on the north side of the brick interior. This is the home of Scoville Brown Cooperative where owner and craftsman Jim Braunscheide conducts his business of taking the old and turning it into something new. Speaking with him on a salvage job site in February, it’s cold, and he has to step inside his warm shop (about a half-mile away) to talk. This particular project is an 1880 house with a demolition contract. Jim has been working on the job for a month, salvaging as much as he can. He sends over a photograph of an ornate architectural detail, a wood accent with a beautiful floral motif hand-carved into it. Jim intentionally left the cobwebs and dust intact to demonstrate what excites him most about it. He sends another photo of his kitchen at home (another half-mile from his shop); natural light spills onto every surface, spotlighting his handiwork. Everything in the kitchen is reclaimed and reused – except for the appliances. All of the woodwork, cabinetry and lighting are repurposed. Come find Scoville Brown Cooperative at Market Hill. Meet Jim, and find something with an interesting story that’s been given a new chapter. For Jessica Fairbrother of Sacred Heart Antiques, each piece is personal. Each one has meaning. When asked about her creative process, she says, “I spend about three months each year in France, Italy and Belgium. When I'm on a buying trip, I look for pieces that I love enough to keep myself. To pass the test, a piece needs to be old, have a history. It should be beautiful, showing its age, and it should tell a story,” she says. “I have to fall a little bit in love with the piece. I look for things with meaning. Things that touch my heart. Things that stop me in my tracks. I never know who I'm buying it for, but my things always seem to find where they are meant to be. In a way, Jessica feels it’s meant to be how she arrived at Market Hill. Jessica had been setting up at Round Top and Warrenton for more than 17 years at several different venues. Sacred Heart Antiques now exclusively sells at Market Hill. It’s hard for her to name one piece she’s looking forward to sharing in the spring show. “I am excited to bring the whole collection to the show,” she says, “Each piece is special in its own way. One of the most interesting things I found this trip is a large desk with 12 secret drawers. When I found it, the drawers were empty. The dealer I bought it from had already cleaned out over 20,000 euros in gold coins. But the possibilities of what those drawers held over the years intrigued me more than the money he had found in it. Was it secret love letters? Information about the French Resistance? The formula for creating the perfect Bordeaux? You never know what history and secrets a piece holds,” Jessica says, leading into another great story. To see some of the pieces offered by Sacred Heart Antiques, “like” them on Facebook. Since the early 1990s, Provenance has been a prominent member of the Atlanta antiques scene, pioneering a brand of high-end furniture with European panache. Owners Artur Tybuszewski and Yarek Filipczak, who have been friends since childhood in Europe, took over the business in 2008, hand-selecting and directly importing each piece from estates, markets and shops in France, Spain and Italy. Artur remained in the South of France to secure purchases and prepare their shipment to the U.S.
Melissa Estock joined the team, making the duo a trio and bringing to the table years of experience in luxury European goods and in owning and operating an antiques store in her hometown of Birmingham, Alabama. Melissa and Yarek make trips to Europe every six weeks or so, primarily to the Mediterranean – the South of France, Italy, Spain and Portugal. “We are very fortunate to make our living by doing something that we truly love. The hunt to find a precious piece is exhilarating. And finding that piece a new home where it will be loved is equally as rewarding. Inspiration and passion is in our nature,” Melissa says. Making the trip to Round Top for a decade now, there is still great excitement. Provenance Antiques is proud to call Market Hill home. As for a sneak peek into what they are bringing for the spring show, Melissa is eager to share. For learn more, visit provenanceantiquesatlanta.com. Hello, folks, and welcome to the world-famous Round Top Antique Show and the wonderful Market Hill! I am a newcomer here, but my owner, Judy Jones, is a 20-year veteran. My life began in Scotland in 1880 when Scottish craftsmen built my cabinet. Then I was sent to London where I was outfitted by F. E. and G. Maund with hand-painted tole bins for bulk tea. After many many years in a Victorian grocery shoppe, my new home became The Plaid Veranda at Market Hill. I like my new home, and I have some very interesting roommates! Judy has a penchant for big boys like me! There is a beautiful old grand oak library from the northern part of France with two doors. She flirts with the 32-foot haberdashery from Garnet, Kansas. It dates from about 1900 and has three bays with recessing glass doors, iron pull out racks, a dressing room and a built-in three-way mirror. Where will my journey take me next? Swiss-born owner Raymond Pittet opened his first Dallas showroom in 1990. Already a recognized expert in antique carpets, tapestries and tribal weavings, he transitioned his interests into antique furnishings and architectural elements. For over 30 years, Raymond has traveled the world making connections in the antiques making Pittet Architecturals one of the leading importers of European architectural elements in the U.S. Their 40,000-SF showroom on Cole Street in Dallas is stocked monthly with finds from France, Spain, Italy and Morocco. Raymond’s son Robinson joined the family business and creative team adding renewed passion and inspiration. “We understand that huge elements made of stone, and flooring are not ‘cash and carry’ items for the average buyer. However, Round Top clientele are sophisticated enough to recognize how singularly special and unique our inventory is. We hope that whenever a client thinks of specialty fireplaces, flooring or fountains, they think of Pittet Architecturals,” Robinson says. You heard it here first. Meet the Pittets at Market Hill, and, in the meantime, visit pittetarch.com to learn more. Nomadic Trading Company is a family affair. Demir Willford, his nephew, Timur, and wife, Lineke, work as a team traveling the world from Holland and France to Hungary and Turkey, bringing back rare antiques and decorative handmade rugs to their 13,000-SF warehouse and store on nearly two acres in Durham, North Carolina. On their last trip to Europe, the trio covered six cities in less the two weeks. You get that feeling when he describes a recent find from this trip. “It’s one of the only places I know where free enterprise flourishes at many different levels from mom and pop vendors to large dealers who ship containers from overseas. This show brings in buyers from all over the world. They are all looking for the unusual products that you can't find anywhere else.” Among these one-of-a-kind products that Nomadic Trading Company offers are antique rugs, several of which they will bring to Market Hill. Stay tuned for Nomadic Trading Company’s online shopping experience at nomadictrading.com. Leftovers Antiques began in 2003 with co-owners Ed Fulkerson and Michael Breddin both realizing they shared a love of antiques from an early age. Their 17,000-SF store, located just west of Brenham, Texas, on Highway 290, officially opened in 2006. Ed and Michael travel extensively around the world in order to bring a unique mix of quality antiques, home accessories and gift items back to the store. 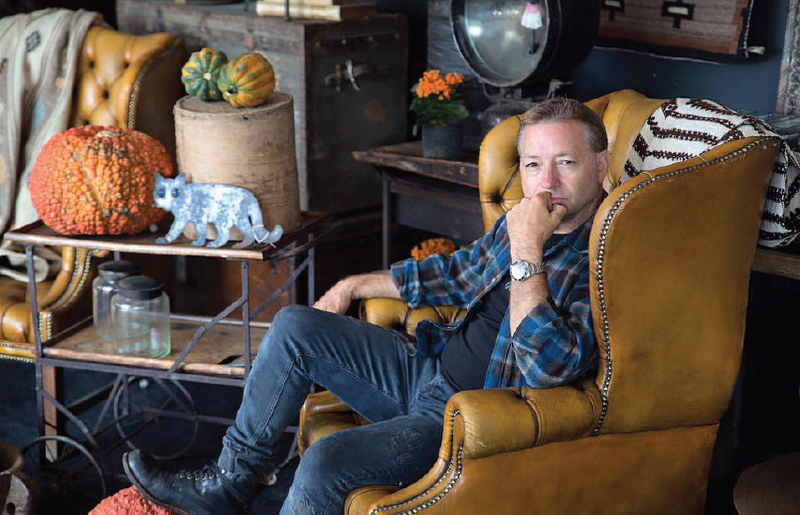 “Being in the antique business, inspiration can come from many places or from seeing many things but you have to have a passion within yourself,” Michael says. To learn more about their story, visit Leftoversantiques.com.